At the beginning of August I embarked on a ‘new’ yoga project. I committed to daily practice of the Primary Series of Ashtanga Vinyasa Yoga. Way back in the earliest days of discovering yoga, it was Ashtanga that I was drawn to. I stared in wonder at all of the beautiful people flowing and floating their beautiful bodies as if they were swimming above ground. Frankly, no matter how hard I tried, it just NEVER worked for me. I felt like a body of cinder blocks flinging, crashing, sinking, straining, huffing and puffing to keep up with the class. I love to flow with my breath. But the tempo of Ashtanga…one breath, one movement never made sense for me. It was hard and hard on my body. Yoga should not hurt or leave one feeling defeated. At least I knew that from early on. I have spent almost 17 years in the yoga rooms where alignment is primary and the poses are treated like sculptures that are chiseled and refined ad infinitum. I know lots of poses pretty well now. I know them for their physical benefits, therapeutic purposes, and as well as for their ‘editorial’ qualities. I love alignment based yoga for a zillion reasons. I am familiar with it and fascinated by it. I will tinker with asana forever. Last month I needed to clear some negative energy in my life and make some changes. As a yogi knows…I had to start with shifting inside. Literally my head hurt from thinking too much and from my ‘monkey mind’ taking over. In my yoga practice I REALLY needed to get out of my head and my tendency to hyper-focus on ‘details’ of alignment. So. Tired. Of. Details. Ugh. The alignment approach, for the first time ever made me feel stuck. Knowing that some form of asana practice would guide me to a lighter place, I revisited my old acquaintance, Ashtanga. The Ashtanga Primary Series is essentially a very simple practice that requires less ‘thinking’ and more flowing. It is a set sequence of poses that trains the student to concentrate awareness on BREATH BANDHAS and DRISHTI. That’s it. Period. It’s more about awakening and harnessing energy than creating pretty poses. With practice, the poses do become light and fluid. But the only way it happens authentically and internally is with practice. After a month of consistent practice, the energy has shifted. The necessary changes in my life have happened without much fanfare. Ashtanga Yoga…I think I am starting to get it. In yoga I feel like a brand new beginner all over again. Everyday I can not wait to get to my mat. What an amazing gift! 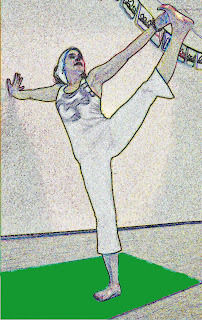 The artistry in the Iyengar and Anusara methods treat poses as a work of art forever in progress. In Ashtanga Vinyasa Yoga the poses are like a series of quick charcoal sketches threaded together to weave a story of vinyasa. Sculpt, weave, paint, sing, or sketch your yoga. It all makes this world a more beautiful place. OM is where the art is.